Is buying in bulk (i.e. 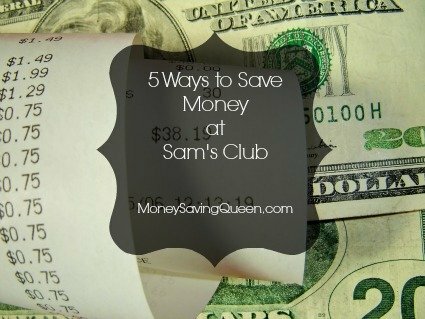 Sam’s Club, Costco) really saving you money? Sam’s Club is typically the store that draws the most confusion when it comes to searching out good deals. After all, 500 Ziploc bags for $8.99 doesn’t sound bad at all, does it? But then there’s the $40 membership fee that has to be taken into account as well. The truth of the matter is Sam’s Club does not take coupons. In the case of the Ziploc bags, you could have actually purchased them individually with a coupon at Walmart for less. 1. Discount Meat: Typically, Sam’s will clearance out meat in the mornings. You may find yesterday’s fresh cuts or meat they are trying to move off the shelf before another truck come in. Most of this is packaged in bulk which makes it easy to stock up on. Remember, you can ask them to cut it anyway you’d like as well. If you find a good deal on steak, they can cut it in half which will give you twice as much. 2. Produce: While not Aldi prices, Sam’s Club prices on produce are pretty incredible. I bought 2 pounds of grapes for under $4 while the same amount would have been nearly $7 at my local Walmart store. 3. Ready Made Meals: Alright, I confess, I am addicted to these. In the meat department, you’ll find fresh, ready made meals for less than $12 each. Could I make it cheaper with coupons? Possibly. Did it save me an incredible amount of time that was worth the price? Yes. The good part about these is that they are fresh (and certainly taste better than my cooking), the meals containing chicken are usually made from the leftover Rotisserie chickens. While I wouldn’t recommend purchasing these for all of your meals, in a pinch, these are great and not so hard on the wallet. 4. Clearance Sales: Have you shopped clearance at Sam’s? You’ll probably find it hidden in the back of the store so you have to keep your eyes peeled. My dining room table was $250 but I grabbed it for only $50 on clearance. That was a few years ago and we still use the table today! The Queen’s opinion: I do like Sam’s for the reasons above, and on occasion, I will purchase bulk items such as plastic cups or utensils for parties. Is it worth the $40 fee? I let my membership go and have not missed it. If you know your prices per ounce then you could really save a ton of money. I found a Pantene deal at Sam’s that would have saved me $30 if I would have bought it. Seriously, that’s a steal! What is your favorite thing about shopping at Sam’s?